The Chicago Justice Project, (CJP), is a not-for-profit organization that is dedicated to increasing public access to justice related information. Our guiding principle is that access to information is the foundation for any meaningful reform to the criminal justice system. Law enforcement agencies should be responsible to a community in their combined efforts to maintain a safe and secure environment. Community members cannot be equal partners in crime prevention? when their access to information is restricted. On the heels of the Data and Public Policy event that I attended on May 8th, this organization makes me wonder if there aren’t many other organizations and indivduals that would get behind the mission of “evidence-based decision-making” in matters of public policy. I would love to connect the leaders of the Chicago Justice Project, along with any other organization, that wants to see more transparency in government data for the purpose of improving society, without any diminishment to individual privacy. A greater national or international voice in support of “EBD” would put greater pressure on governmental organizations to share their data with their constituents. This may be “apple pie,” but I believe that this sharing of data will lead to better and more effective policies. The Chicago Police Department (CPD) is extremely restrictive about who gets access to data they create. It is clear that the CPD will not release data that can eventually be used against them to critique their actions; thus, it is the responsibility of all academics to question the legitimacy of all research that is based on what can only be thought of as coerced access. Is there some sort of overt or covert deal cut or understanding made, I do not know; but I must question the legitimacy of the access. While the CPD stance is disappointing, it is good to get this out in the open so that a real debate can begin about governmental data being shared. More data on the spray will be posted on this site, but, for the time being, I’m posting this article from MSNBC indicating that USDA is now cancelling a program to make available to public citizens the data about what pesticides have been used where. At the surface, this action seems deplorable and irresponsible. Yes, gathering data costs money, but knowing where pesticides have been sprayed seems vital to understanding adverse health affects caused by the spraying of pesticides. FRESNO, Calif. – Consumers and farmers will soon be on their own when it comes to finding out which pesticides are being sprayed on everything from corn to apples. The U.S. Department of Agriculture said Wednesday it plans to do away with publishing its national survey tracking pesticide use, despite opposition from prominent scientists, the nation’s largest farming organizations and environmental groups. Since 1990, farmers and consumer advocates have relied on the agency’s detailed annual report to learn which states apply the most pesticides and where bug and weed killers are most heavily sprayed to help cotton, grapes and oranges grow. The U.S. Environmental Protection Agency also uses the fine-grained data when figuring out how chemicals should be regulated, and which pesticides pose the greatest risk to public health. Joe Reilly, an acting administrator at the National Agricultural Statistics Service, said the program was cut because the agency could no longer afford to spend the $8 million the survey sapped from its $160 million annual budget. “Unless new funds are made available there’s not much that we can do,” Reilly said. While the agency “hates eliminating any report that is actually needed out in the American public,” he said consumers could find similar data from private sources. Still, only a handful of the major agricultural chemical companies spend the approximately $500,000 it costs to buy a full set of the privately collected data each year, according to a letter written by an advisory committee to the agency. Most farmers can’t afford to pay for the information and environmental groups use it to analyze which chemicals could turn up in local water supplies or endanger critical species. Pesticide companies also rely on the program when they’re looking to reregister agricultural chemicals, said Beth Carroll, a senior stewardship manager with Syngenta Crop Protection, Inc.
Reilly said the agency would “love to reinstate the program,” but said for now it will only do key surveys. Those include the monthly crop report, which influences commodity prices on the futures market, and livestock reports, which set the price for hogs and cattle. At a time when consumers are increasingly curious about what goes into their food, farmers, chemical companies and advocacy groups said the cuts would have wide-ranging affects. 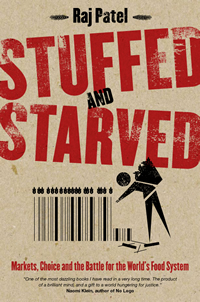 Interesting book featured in today’s (May 10) SF Chronicle about the global food system. The growth of bottled water, in my mind, is part of the growth of obesity. And obesity is a result of certain countries, as a whole, being wealthy. Evidence of this is that we have a significant number of Americans who both live in poverty (or in “low-income”) and are obese. I saw a good film last night about the problems of access to clean drinking water in both developing and developed countries. 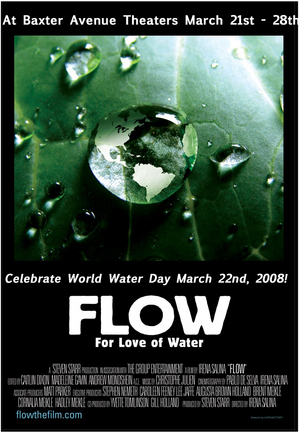 The film is called FLOW, which means For Love Of Water. I say “good” and not “great” because like so many other documentaries, it relies largely upon anecdotal evidence to convey its message. However, it conveyed its message well and, for the most part, accurately: the message is that many, many poor people do not have access to clean drinking water and the consequences are deplorable. Over 1 billion people is the number that I have heard. Over 2 million people die each year from waterborne diseases and most of those deaths are children under the age of 5. The movie portrayed Suez and Vivendi, the global companies delivering water in developing countries like Bolivia, as evil. Also portrayed as evil was The World Bank, who funds dams and other large capital projects. We are rich. Bottled water in our country sells for about 1,000 times more than tap water. I challenge anyone to come up with another product where a packaged and branded version sells for 1,000 times more than the non-packaged and non-branded version. Tap and bottled water in our country are essentially the same in quality. So, because we are so rich and because municipal water agencies have done such a lousy job of marketing their water, bottled water companies have created an industry where there was not one 30 years ago. In developing countries, the issue that water is highlighting is governance. As far as I can see, the problem is not Suez and Vivendi. There will always be large multinationals and we should not blame them, unless they are engaging in illegal activities. The problem is the governments of the cities, states and countries that have not organized themselves to make provisions for the basic needs of life, which include food, water, shelter and clothing. If the government is corrupt and makes deals with large corporations to provide privatized water, or if the government is short-sighted and makes the same deals with large corporations, something needs to be done about the government. To do something about the government means that the people need to organize themselves and demand a government that provides certain services from their government. Corruption must be fought. Government must have integrity. The main purpose of taxes in any city, state or country should be to provide basic services for its citizens. That means infrastructure! Clean drinking water is just one of many services that, I believe, every citizen of every country should have.